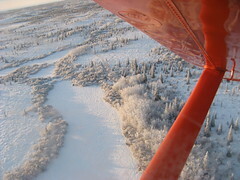 Refuge Officer and pilot Isaac Bedingfield and I went up to the Yukon River checking for illegal moose harvest in a moratorium area. Isaac is a great bush pilot and one the refuge’s younger talents. This is a where’s Waldo picture. Can you find the moose? We saw a bunch of moose, and it was my first venture into the Yukon watershed part of the refuge. It was a blue bird day and we could see all the mountains that the surround the Delta. We landed on a frozen lake for a bladder break in the C-185. The break was quick at 10 below on a January day.